Bayern Munich defender Mats Hummels won back-to-back Bundesliga titles with Borussia Dortmund in 2010-11 and 2011-12. A mainstay of those brilliant Jurgen Klopp teams, the Germany international knows exactly what a fully functioning Dortmund at peak form looks like – pace, drive and scintillating attacking play from a team at one with the fanatic support of Signal Iduna Park's "Yellow Wall". "I've talked to a few people about it already, it is reminiscent of the early Kloppo years," the centre-back told reporters, reflecting on a flying start that sees BVB top of the table and unbeaten in 10 Bundesliga games. "Maybe not everyone in our team, but I enjoy watching Dortmund games." Hummels' enjoyment aside, it is a long time since Bayern have had reason to enter a Klassiker with such trepidation. 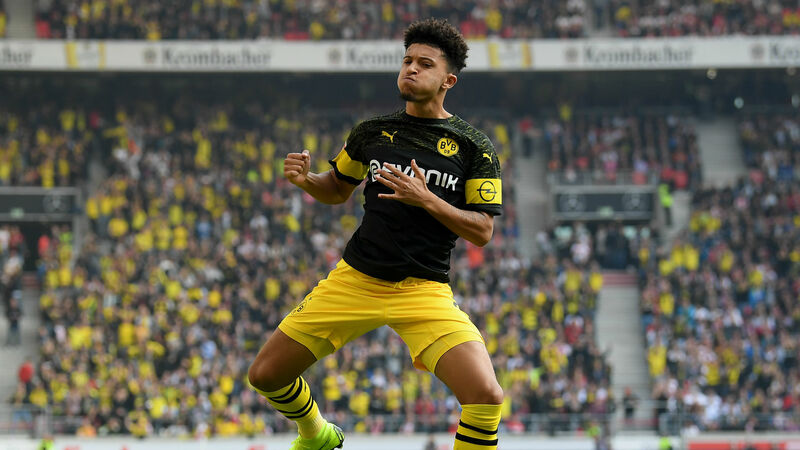 When Niko Kovac's Bayern arrive in Dortmund on Saturday, their chances of emerging with a positive result may depend upon how effectively they can shackle one of the brightest young talents in Europe. Jadon Sancho's decision to turn his back on Manchester City last year raised some eyebrows, but the Englishman's bold ambition has been rewarded. He is the new darling of the BVB faithful and a full international. The 18-year-old's transformation from super-sub to first-team mainstay is continuing at a rapid rate and only Sebastien Haller of Eintracht Frankfurt can boast more than Sancho's 10 goal involvements in the Bundesliga this season (four goals, six assists). An inventive dribbler with an eye for the killer pass, Sancho is a relentless performer who averages 41 sprints per 90 minutes. Bayern left-back David Alaba will know he has been in a game. Sancho is not the only source of youthful exuberance and ingenuity. Like in the Klopp years, it courses through Lucien Favre's side. Christian Pulisic is not starting as much as he might like due to Sancho's emergence, but the 20-year-old United States star is an attacker with mercurial ability. Jacob Bruun Larsen is another 20-year-old wideman who is flourishing after spending an injury-ruined season at Stuttgart, while acquired loanee Achraf Hakimi is building on his initial promise at Real Madrid and has weighed in with a trio of assists from full-back. Favre's team are not just about fresh-faced players tearing forward. Centre-backs Abdou Diallo and Dan-Axel Zagadou have a combined age of 41. Only RB Leipzig (nine) have conceded fewer Bundesliga goals than Dortmund's 10 and BVB's bookings (nine) and fouls conceded (80) mark league lows, speak of a collective composure beyond their years. Marco Reus was once their bright young thing. Now 29 and fit again, the Germany international has six goals this season and appears revitalised. Spain forward Paco Alcacer is even more prolific, with eight in seven games. The purchase option of an initial €23m in his loan agreement from Barcelona looks like a ludicrous steal. Alcacer's signing is a symbol of the smooth operation of Dortmund's sporting operation over recent months - another factor that harks back to the Klopp years. Thomas Tuchel was an immensely gifted coach but confrontations contributed to burning his reign out. However supportive chief executive Hans-Joachim Watzke and sporting director Michael Zorc might have wished to be when it came to Peter Bosz and Peter Stoger, results would not allow an enduring relationship. Favre's relaxed and softly spoken demeanour cuts a contrast with Dortmund's most famous former manager, but his nurturing impact on players finding their way in the game has been clear. The 61-year-old Swiss, who even managed to keep Mario Balotelli on the straight and narrow during his time at Nice, also has a shrewd eye for game-changing substitutions. Sancho and Raphael Guerreiro coming off the bench to score three of BVB's four goals in the 4-0 Champions League bludgeoning of Atletico Madrid was the most explicit example of this, but a league-high 11 goals in the final 15 minutes of Bundesliga matches this season demonstrates a consistent pattern. Following the recent 2-2 draw against Hertha Berlin, where Dortmund twice threw away a lead, Watzke dismissed them as "too green" to claim the title. Win on Saturday to open up a seven-point advantage over Bayern and he might come to think his old employee Hummels has a point.